After traveling throughout Italy with his father, von Guérard got in touch with The Nazarenes, a group of German romantic painters that were expatriated in Rome and that had occupied the abandoned monastery of San Isidoro, where they lived. They rejected the neoclassicism because of its “artistic superficial virtuosity” and they looked, through nature, a mean to bond with God. Young Eugene kept traveling to different parts of the world until he got to Victoria, Australia, in 1852: blinded by the gold fever, he took his chances in this English colony. Evidently, our artist experienced a serious conflict regarding his vocation. However, in failing as a gold-digger, he started painting again. Influenced by The Nazarenes and the outdoor Australian life, he paints romantic landscapes and, by 1860, he becomes the most important nature painter of the colonies. 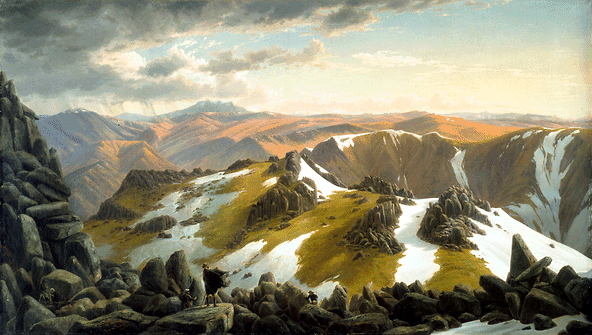 North-east View from the Northern Top of Mount Kosciusko has the same style as the paintings by Caspar David Friedrich, and they only have one topic: the insignificant human being in front of the majesty of nature. Here we see 5 people (can you see them all?) in front of a mountain landscape. The handling of light is extremely effective: in the front, the people are left in shadows; in the background, the mountains are lit, which makes them more powerful. There are 3 layers in the painting: in the front, the people in darkness; in the center, the snowy chain of mountains; and, in the back, the reddish chain of mounts. Regarding the first layer, the rocks seem to be piled in a weird way, one above the other. I’ve never seen rocks piled that way. Although I’m not a geologist or anything, I do not think this is real, but I think that this layer came strictly out of von Guérard’s head. Regarding the second and third layer, I also find something strange: in the second, the mountains are snowy and wet and, in the third, the mounts are red and dry, typical of the Australian desert. Would our friend Eugene have wanted to overlap different kinds of landscapes in the same work to achieve contrasts that, in nature, do not exist? I guess. Long post. Today I was inspired. ~ by Álvaro Mazzino on July 13, 2010. This entry was posted on July 13, 2010 at 17:11 and is filed under Romanticism.You can follow any responses to this entry through the RSS 2.0 feed.You can leave a response, or trackback from your own site.